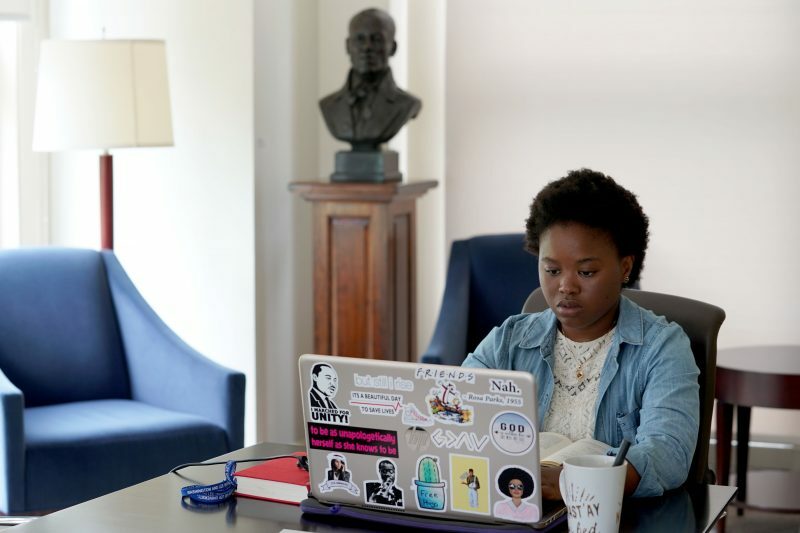 ‘These Spaces They Imagined’ Joelle Simeu '20 is working this summer on "The Politics and Poetics of Space in the Works of Martin Luther King Jr. and Leopold Senghor," a project with Professor Mohamed Kamara. Joelle Simeu takes notes as she reads as part of her research for the project “The Politics and Poetics of Space in the Works of Martin Luther King Jr. and Leopold Senghor” in the Chavis Boardroom. Q. What are you doing for the summer? I am working on a project titled “The Politics and Poetics of Space in the Works of Martin Luther King Jr. and Leopold Senghor.” We are looking at their ideas of the Promised Land (and its iteration in what Dr. King called the Beloved Community and what Senghor called the Civilization of the Universal), and trying to figure out whether these spaces they imagined—a world that is welcoming to all people of different cultures—is possible or merely utopian. Q: Are you staying on campus? If not, where is your work taking place and what do you like best about that location? Yes, I am staying on campus in the third-year housing, The Village, for two months. On the average day, I will wake up and work out. My research involves a lot of reading so I usually choose a spot for the day. Some favorites include Chavis Boardroom, my study in the library, and the alumni house porch. Q. What is the most interesting thing you have learned while working on this project? The most interesting thing I’ve learned while researching has been Martin Luther King Jr.’s sermons and speeches. He has delivered so many speeches inspiring people to fight for equal rights, and I have been enjoying learning more about the ones that are a bit less known, but still as riveting. The biggest challenge I have faced is time management. My research involves a lot of reading, so I just always have to make sure that I remain focused on my tasks throughout the day. Q. Have you had any mentors during this time? Yes, Professor Kamara has been mentoring me throughout my research. I took one of his classes this year, an introduction to Africana Studies, and I approached him during the year about working together over the summer on a research project. We meet once or twice a week to talk about my work, and I send him weekly progress reports regarding what I have learned. This research has certainly solidified my intentions of minoring in Africana Studies, because I know that I can take the knowledge that I am gaining this summer into different areas of my studies in ensuing years. My first year involved several heavy-reading classes, so I learned how to read and analyze well over the course of the year. The intro to Africana Studies class last year prepared me to think critically about issues surrounding the black perspective, which definitely relates to our current project. Because it allows them to pursue specific topics in their field of interest without also juggling several other classes. It is a great way to help students explore an academic area more intimately.